Following an international search, local expert Professor Jennifer Philip has been appointed to the prestigious position of Chair of Palliative Medicine. 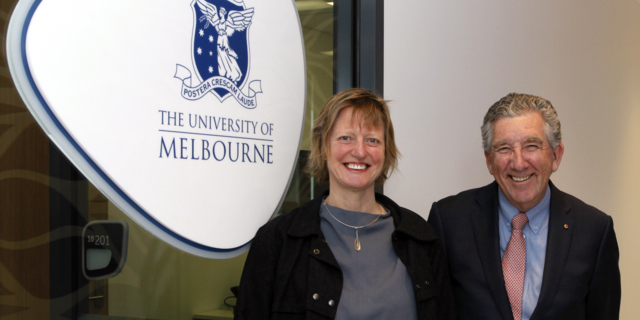 The position was created by the University of Melbourne and St Vincent’s Hospital Melbourne as part of their commitment to the Victorian Comprehensive Cancer Centre’s (VCCC) Leaders in Cancer strategy. Professor Philip, Deputy Director, Palliative Medicine at St Vincent’s has extensive international credentials in academic and clinical research in palliative care with a focus on clinical trials and evidence-based supportive care. St Vincent’s has a long history of providing palliative care. The first inpatient palliative care facility in Victoria, Caritas Christi Hospice in Kew, was founded by the Sisters of Charity in 1938. In the late '90s one of the palliative care wards was relocated to Fitzroy and, in 2008, Caritas Christi became a part of St Vincent’s. Now, St Vincent’s Palliative Care Services consist of eight inpatient beds in Fitzroy and 28 inpatient beds in Kew, as well as a variety of other services and programs. One of these is the Centre for Palliative Care, a Collaborative Centre of the University of Melbourne established in 1996. As Chair of Palliative Medicine, Professor Philip will work to improve patient access to clinical research studies, build research capability and ensure that all care provided to patients with advanced disease is informed by evidence and delivered by people who are well-trained, supported, compassionate, and passionate about what they do. Professor Phillip said it was an honour to accept the prestigious appointment. 'This is still a relatively new area of clinical care. There is enormous scope for research and training, and to forge new ideas and directions in palliative care research. More broadly, we want to spark conversations about how we live fully and die well,' Professor Philip said. Professor Linda Kristjanson, Chair of the VCCC, says the new position will make a real difference. 'This new Chair of Palliative Medicine is founded on an overarching goal to ensure people in Victoria have access to the health care they deserve and need in the face of advanced and serious illness. Prof Philip is committed to facilitating health care that is equitable; not dependent upon chance; informed by the best evidence and delivered with compassion and generosity.